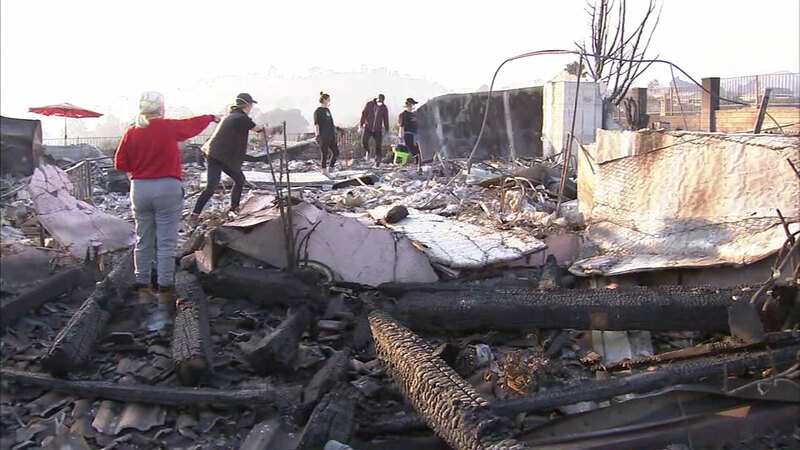 Residents sift through the rubble of a home destroyed in the Thomas Fire. LOS ANGELES (KABC) -- As brush fires around Southern California force thousands of people from their homes, Los Angeles officials are warning residents to look out for and report instances of price gouging. Gouging can occur with contractors preying on desperate people trying to repair or rebuild homes and it can happen with people selling emergency supplies like gasoline and medicine. Thousands of people have been forced to evacuate their homes in Southern California amid massive brush fires burning in Los Angeles and Ventura counties that have burned more than 100,000 acres. As people flee their homes, City Attorney Mike Feuer warned them to look out for gouging on hotel rooms, gasoline, generators and other emergency items. "Price gouging during a public emergency isn't just outrageous, it's illegal," Feuer said. "Consumers should be very wary of price spikes for hotel rooms, gasoline and emergency items like generators. If you suspect price gouging, report it to my office immediately. When appropriate we will prosecute." Price gouging is illegal when a local state of emergency has been declared, Feuer's office said. Gouging is defined as a price hike that is 10 percent higher than charged prior to the declaration of emergency for items such as medical supplies, home heating oil, building materials, hotel rooms, transportation and other goods and services. Also, for 180 days after the emergency declaration, contractors cannot offer their services related to emergency repair or cleanup for 10 percent higher than they previously charged, unless justified by factors such as higher costs for labor or materials. Anyone who suspects they have been the victim of price gouging or has information about it occurring can contact the City Attorney's Office online or by calling (213)978-8340. A conviction for price gouging is punishable by up to one year in county jail or fines up to $10,000.